Here is the first car my father owned. 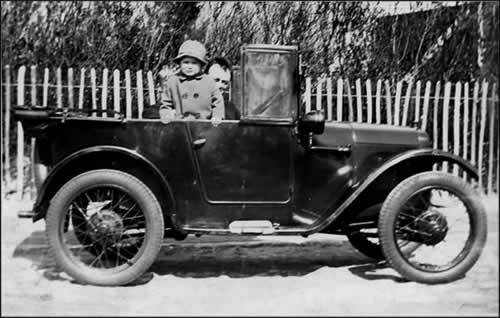 An Austin 7 Tourer. My brother peering over the side. He must have been about three, so that would make the date around 1932. My father was pleased to get 40 mpg out of his Austins (later had a Ruby Saloon). The Austin Seven was produced from 1922 through to 1939 by the Austin Motor Company. In the UK, it was nicknamed the "Baby Austin" and had a 4 cylinder 747cc side-valve engine.